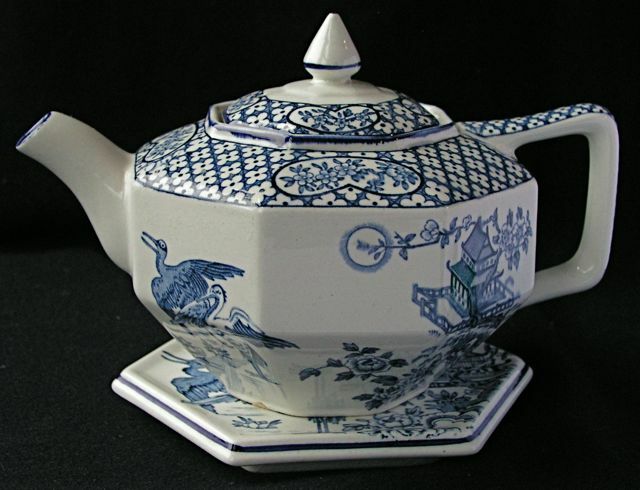 This classic blue & white Chinese-inspired FREDERICK RHEAD pattern resembles his Yuan design, but is much harder to find. 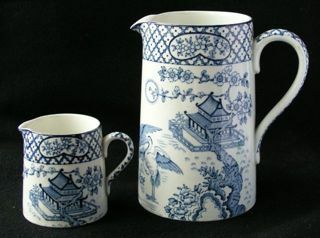 The design incorporates a pair of storks in a Chinese landscape with a full moon, blossoms, and a temple with similarities to some of the buildings in his Kang-Hi pattern. 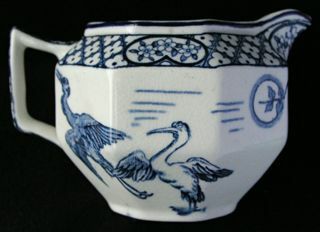 Unlike YUAN, the pattern generally features the same birds on all items, but we did once see a teaplate with a different bird on (see bottom of the 'Plates' page). Golden Moon (also designed by Rhead). 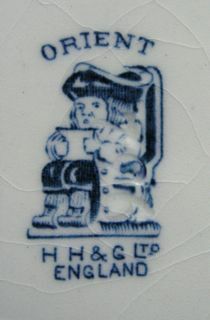 Although some ORIENT items can be found with a Wood & Sons mark, the great majority bear the retailers' mark instead - a Toby jug logo with the initials HH&G Ltd, standing for HALES, HANCOCK & GODWIN. 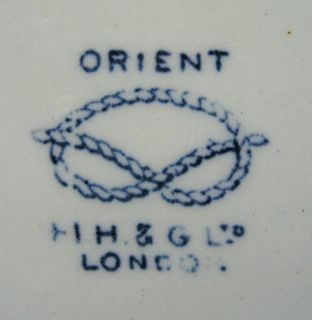 This mark was also designed by Frederick Rhead, and is illustrated on p32 of Bernard Bumpus's book 'Collecting Rhead Pottery' (Francis Joseph, 1999). 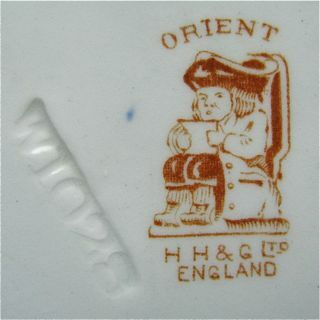 One can occasionally find the ORIENT pattern as a BROWN transfer with hand painted enamels (see below) - this COLOURED version is very hard to find. 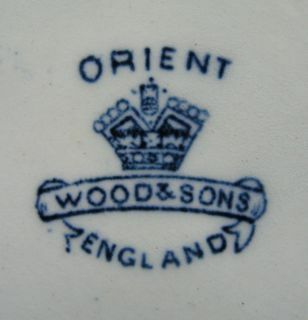 In terms of shape, ORIENT is something of a hybrid pattern. 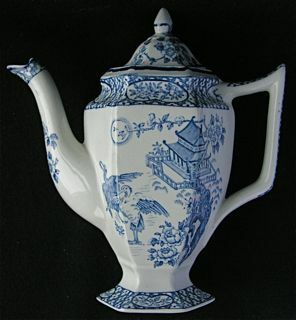 Typically, jugs, creamers, teapots and coffee pots are found in Woods' classic OCTAGONAL/HEXAGONAL shape, as seen in Frederick Rhead's Alva and Westover patterns. 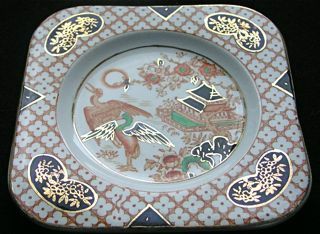 However, soup, vegetable and sauce tureens were produced in the ornate shape associated with the Khotan and Buddha design (also by Frederick Rhead) - see the Plates, Platters & Serving Dishes page. It is unusual for a Woods pattern to cross over between shapes in this way. 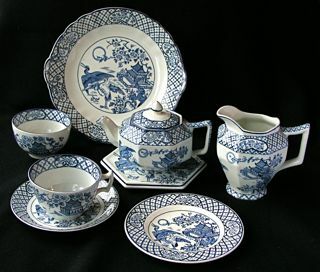 Other items follow the generic Woods shapes of the 1920s and 30s, eg: toast racks, biscuit barrels, cheese dishes, oblong sandwich plates, gravy boats, etc.